The BBC has given an insight into its decision to offer the iPlayer on BT Vision – suggesting the partnership represents a 'major advance'. The success of the iPlayer on Virgin Media's cable service and on both PS3 and Wii have been proof that consumers are keen to watch catch-up TV on their traditional television sets. And a partnership with BT now means that the iPlayer will be accessible through the BT Vision IPTV service. 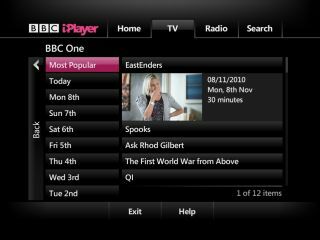 "Opening BBC iPlayer on TV to such a large connected audience represents a major advance in our effort to bring the full BBC iPlayer experience to TVs, blogged TV iPlayer product manager Gideon Summerfield. "Already, nearly a third of all TV programmes enjoyed through BBC iPlayer are watched using TV-connected devices including games consoles, set-top boxes, disc players and connected TVs. "This is all the more enjoyable when the experience is accessed from the same remote as the TV, as is the case with BT Vision." The BBC blog also outlined the technology that was used to bring the service to BT Vision. "BT Vision's set-top boxes use the Microsoft Mediaroom IPTV platform to deliver TV on demand alongside TV broadcast over Freeview, added Summerfield. "Last year Microsoft added a technology to this called Presentation Framework (MSPF) to let IPTV network operators add extra services delivered over the Web. "We partnered with Pushbutton to build the BBC iPlayer app on BT Vision using this technology. You'll see the experience is pretty slick!"